Looking east around 8 p.m. on an early December evening. Thus Robert Frost describes Orion's appearance in theeastern sky in early December. If you go out any night this month around 8 p.m. and lookeast, you will see Orion rising. His shoulders are marked with the bright starsBetelgeuse and Bellatrix and his knees by Saiph and Rigel [See Map]. In between are three stars in a line which mark his belt. WhenOrion is high overhead, this belt is at a jaunty angle, but when rising in theNorthern Hemisphere the three stars are in almost a vertical line; when settingnine hours later they are almost horizontal. Incidentally, Orion is an"equal opportunity" constellation: located on the celestial equator,it is readily observed from anywhere on Earth other than the poles. One of the first things to notice about Orion is thecontrast in color between its two brighteststars: Betelgeuse in the upper left corner is a old red giant while Rigelin the lower right is a young blue star. (Left and right, and up and down arereversed if you are observing from the Southern Hemisphere.) Like most redgiants, Betelgeuse is a variable star. Its brightness can be seen to changeover a period of months as it expands and contracts in size. Many of the stars in Orion are double or multiple whenviewed with a small telescope. Rigel is particularly interesting because itsbright 1st magnitude primary star is accompanied by a faint 7th magnitudesecondary star. In a telescope this pair looks like a star and accompanyingplanet, though the "planet" in this case is a white dwarf star. The most interesting area in Orion is the Orion Nebula andits associated stars. 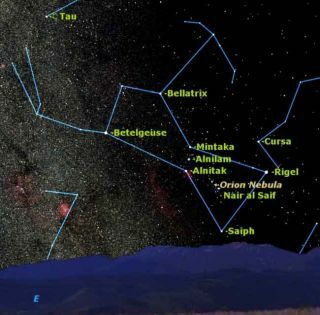 You find this by starting with the line of three 2ndmagnitude stars which form the Belt of Orion: from left to right, Alnitak,Alnilam and Mintaka. Below these stars is a line of three fainter stars whichform the Sword of Orion. The middle of these three, known as Theta or TheTrapezium, is the star we are interested in. In a small telescope, Theta is seen to be a quadruple star:four stars arranged to form a trapezium. With a larger telescope, at least twomore tiny components can be seen in the Trapezium. The most wonderful thing about the Trapezium? is that it isengulfed in nebulosity: the Great Nebula of Orion, number 45 in Messier'scatalog. In a dark sky, this birthplace of new stars can be readily seen inbinoculars as a faint glow around Theta. In any sky it is visible in telescopesof all sizes. In fact, it is arguably the most beautiful object visibleanywhere in the sky in any telescope, large or small. It is interestingto look at with any magnification, also with or without various nebula filters.Even experienced observers can lose themselves for hours in its glowingswirling clouds of gas and dust. One famous deep sky object in Orion which beginners willlook for in vain is the HorseheadNebula. A popular subject for astrophotographers, visually this is one ofthe most challenging objects in the sky. Many experienced observers with hundredsof deep sky objects to their credit have never seen the Horsehead. The reasonis that this is a dark nebula (a dense cloud of dust) visible only as asilhouette against a very faint emission nebula. This emission nebula can onlybe seen with the help of a special filter, which passes only the beta spectralline of hydrogen. Even with this special filter, it requires an extremely darksky and a very skilled eye.